The time period was chosen for two reasons. Firstly the drop in house prices first began in the second quarter of 2007 and secondly because this coincided with the general election that year which was held on the 24th of May. This election was probably the last major opportunity for debate in the ‘public sphere’ on the property bubble before the crash, and certainly it was the last opportunity for people to vote before the crash. In the coverage of property in the Irish Times and Irish Independent a key finding was the dominance of elite sources connected with the property and finance industries as compared to ordinary sources such as home buyers and renters. In fact, out of 800 articles, only one reflected critically the views of tenants. This is especially the case in the property and business sections. The greatest total single overall source on the issue of housing is comprised of estate agents, accounting for some 28% of total sources and 29% of sources by frequency. 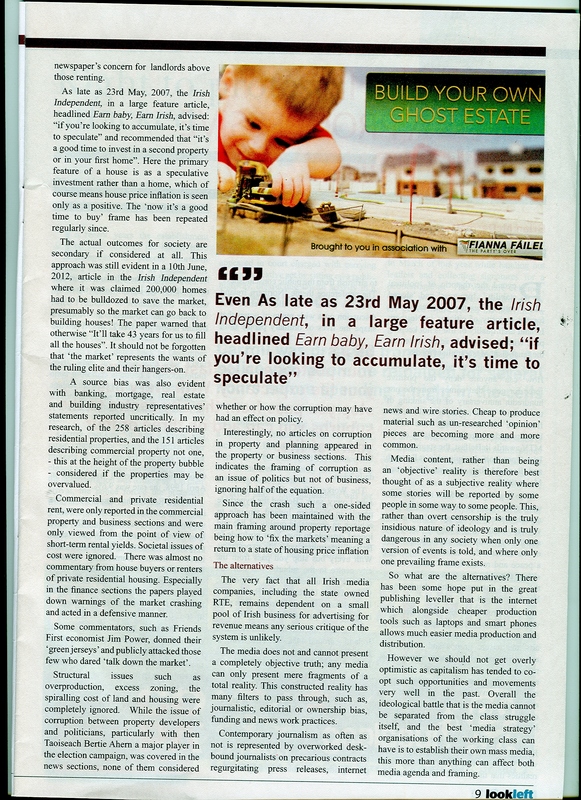 This high skewing of estate agent sources is due to the large number of advertorial articles in the property sections but nonetheless the lack of critique within the property sections even from a consumer perspective (never mind a public interest, business or societal perspective), still leaves much to be desired. …the parties with pro-market polices make up the vast majority of sources in the papers although it may be argued this reflected party political support at the time. When compared, the Irish Independent and Irish Times have a roughly similar ratio of party political representation. Economically right wing political sources make up the majority with approximately 65% of representatives being openly free market parties (Fianna Fail, Fine Gael and the Progressive Democrats). If we include Labour who had a 2007 policy of subsidising the market by offering large grants to be used to buy private housing (the number would go up to approximately 77%). Representatives of parties that call for non-market solutions to housing make up just under 9% of sources (Sinn Fein, The Socialist Party and People Before Profit Alliance), while the Green Party, which called for stricter market regulation, come in at 10.5%. The most striking figure is that of what we term use value sources, that is sources such as renters and home buyers who are interested in the property solely for its use, i.e. to live or work in it. Use value sources make up only 2% of total sources and appearing in only 2% of all articles. This compares to ‘exchange value’ sources (from the property and finance industries) making up 43% of total sources and appearing in 44% of all articles. A key observation from this research is that statements from sources in private industry are generally reported as fact with little or no critique. There is an absence of critical engagement with the claims advanced by such manifestly partisan sources and the consequent lack of any independent or investigative journalism orientated to a wider public interest. This overly skewed sourcing could be described as a manifest ‘capturing’ of the press by property and finance sources and may help to explain the downplaying of the oncoming crisis, and the lack of critique of the massive inflation of the cost of housing as will be discussed below. The key trends included an overall market-orientated frame: that is that housing was primarily looked at from the point of view of the market rather than society. Elements of this included the privileging of exchange value over use value, non-critical reporting of markets and market sources, and a ‘fragmented imagination’ – that is the artificial division of events. For example, while corruption on housing issues such as rezoning was heavily covered in the news sections on the political side, the industrial side of the corruption was completely ignored and corruption itself was not covered in business or property sections of the papers. The role of the state, following clear neo-liberal norms, is seen positively, as existing to serve the market, to return it to stability; or negatively as a malign force causing instability in the markets. The residential property supplement in both newspapers displayed an uncritical, aspirational and advertorial discourse when reporting individual properties. At times, advertorial type articles also find their way into the business and news sections. Not one article questioned whether an individual property may be overpriced, the minimum expected of even a consumerist publication. Overall in the newspapers, including the news sections, the key issue is of the market and ‘market stability’ rather than either consumer or social good. 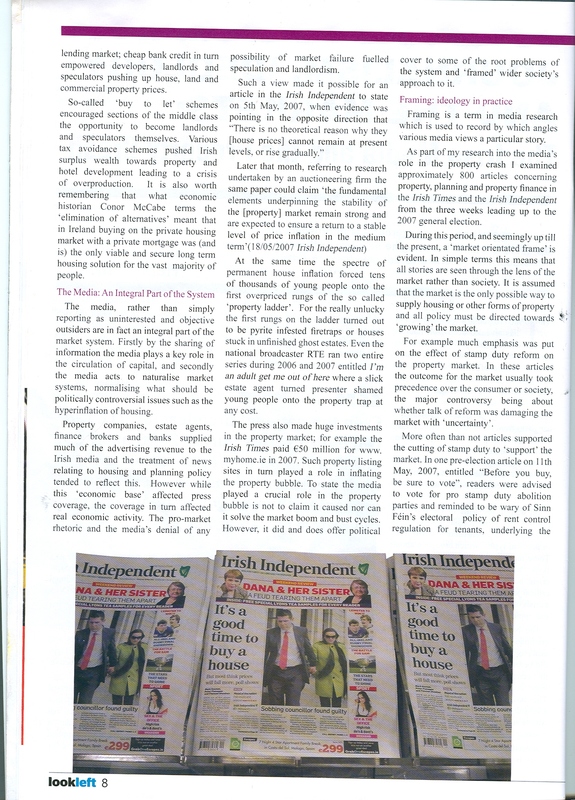 In the news sections there is an acknowledgement of a need for a second tier housing supply for those who cannot afford to purchase on the open market. But the third tier of private rental accommodation (beyond one article) remains invisible. In the property and commercial sections the rental property market is framed from the perspective of landlords and investors. Even second tier housing is framed on a market basis from the point of view of private companies or developers involved in the supply of public housing. In Op-Ed articles, market stability is the major issue again trumping the crisis of affordability or the social need for housing. The only questioning of rental prices is from the point of view of business focusing on the danger of wage demand inflation arising from higher rents. The discussion around state policy played into the neoliberal trope of state ‘interference’ distorting a functioning market. Material issues such as overproduction and price inflation are ignored and assumptions of market self-regulation (without state interference) appear implied. This is an important finding as it reflects the neo-classical viewpoint that markets work and are self-regulating and that crisis came not from markets themselves but from behavioural, psychological and political interferences that cause irrational exuberance, crashes and crises. Again, given the non-critical sourcing of both papers from orthodox neoclassical economists and the lack of any evidence of independent fact checking or investigation, this is probably not surprising. There is ample evidence from the research to state that the role of newspapers when covering the property industry was not one of objective reporters or ‘watchdogs’ reporting on the issue of housing from the point of public interest. Rather, the newspapers’ key role was as advertisers for the industry, facilitating exchanges of uncritical information between industry players, and as an ideological apparatus. This apparatus acted to normalise the hyperinflation of housing, celebrate high property prices, downplay alternatives and, crucially, acted to play down the contradictions in the Irish system that were heading towards a crash. The newspapers did not act in accordance with the overall public interest in mind but rather narrow sectional and economistic interests. There were some exceptions to this, in particular in some opinion pieces. However, the main trends and frames point to a ‘captured press’; that is a press in the service of a narrow class-based interest. This does not represent an accusation of a ‘conspiracy’, as stated by Geraldine Kennedy (2015) in her evidence to the banking inquiry. Rather, this is evidence of key structural, institutional and ideological biases that were apparent in the analysis of the content. A key element to this process was the framing of housing not as a social need but as a commodity whose chief role was to create wealth rather than supply housing. This allowed for the celebration of the hyperinflation of housing and rental costs. The market-orientated framing also included the neo-classical and idealistic belief in market self-regulation, either denying or playing down the possibility of a crash. The lack of critique may well have helped to both build and prolong the bubble itself. That is not to say the media caused the crisis. There were long term material and political structural issues at its core. However, the newspapers did play the role of facilitator, supplying ideological and political cover to an economic elite who profiteered greatly from the hyperinflation of housing and the sale of financial products. This assisted in laying the grounds for the housing crash, the economic crisis and the subsequent financial bailout, alongside the severe austerity policies that then followed. The Live Register hosted a podcast discussion on the Media, Crisis and the making of common sense between Henry Silke of this parish and Julian Mercille of UCD. Why is the vast majority of Irish media dominated with an undoubting and uncritical attitude towards a single theory of the ‘crisis’? What role does it play in legitimising, rather than challenging, the structural causes of growing inequality? And what does this mean for radical interpretations of democracy, public space and the remaking of common sense? In this Live Register podcast, we’re joined by Julien Mercille and Henry Silke, two academics who have been carrying out separate research relating to the Irish media. Julien Marcille lectures at the School of Geography in UCD and has recently published research on how the Irish mainstream media have covered the Irish “crisis” from a pro-austerity position over the last five years. Henry Silke is a postgraduate researcher at the School of Communications DCU, who has been examining the political role of the Irish press during the crisis. We used their research to frame a wider discussion of the real role of mainstream media in Ireland today, exploring how market ideology is central to how mainstream media frames public discourse, very much at odds to the perception of mainstream media holding truth to power. 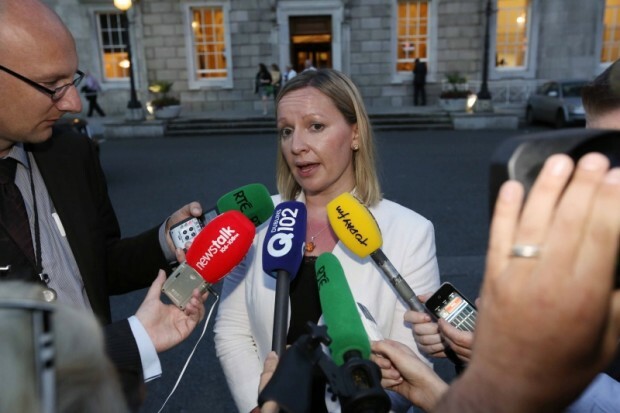 On January 25th 2014 coming, ex Junior Minister Lucinda Creighton, and the newly formed Reform Alliance are to hold a launch meeting in the RDS. The meeting is expected to draw 300 to 400 people and has been dubbed a ‘monster meeting’ (Sunday Independent 5 January 2014) and an ‘Ard Fheis’ style rally (RTE.ie 6th January 2014). The meeting has received quite a lot of media attention, including a long one-to-one interview with Lucinda Creighton on RTE’s flagship television current affairs programme Prime Time to discuss the new formation (RTE 7th January 2014), a full three weeks ahead of the rally (see Broadsheet.ie for a transcript here). The alliance is made up of seven ex Fine Gael TDs and Senators who split with the Party in opposition to last years abortion reform. The Alliance can be described as socially conservative and economically liberal; some have dubbed it a Progressive Democrats mark II, (for example Rory Hearne here). A type of party that certain sections of the media, especially the Sunday Independent, have been calling for for some time. The Reform Alliance, however, seems to have neither the intellectual grounding nor the popular appeal of the Progressive Democrats and its long term viability is not certain. Moreover, the PDs were first and foremost a neo-liberal party which allowed for social liberalism on issues such as divorce and contraception. The Reform Alliance seems to more be more akin to the US right, which combine social and religious conservatism with economic liberalism and it is yet to be seen how much popular appeal exists for such an ideology here, or if the alliance has legs. Already some prominent economists and independent politicians, most notably David McWilliams and Stephen Donnelly have declared that they will not support the Alliance as it is too socially conservative. (See Cedar Lounge Revolution here for more declines). While watching some of the media coverage, it occurred to me that another alliance launched in 2010 didn’t seem to get anything like the coverage of the Reform Alliance: The United Left Alliance was launched on the 29th of November 2010 with a meeting of three to four hundred in the Gresham Hotel, but was not described anywhere as a ‘monster’ or ‘Ard Fheis’ style meeting. In fact, as memory serves, there wasn’t much coverage of it at all. The ULA launch on the 29th of November 2010 – not a ‘monster’ rally. The ULA was an alliance between the already existing left groups: the Socialist Party; the Socialist Workers Party; the Tipperary Workers and Unemployed Action Group; and the People Before Profit Alliance. The ULA had a similar political weight to Lucinda Creighton’s Reform Alliance with one MEP, and numerous councillors , this was evident by the election of 5 TDs in the following election. The United Left Alliance didn’t last very long and split within two years, some details on this can be found here. 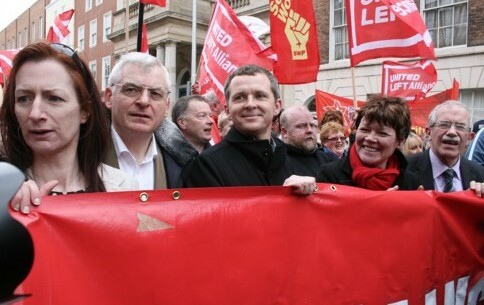 In 2010, however, the split was not a foregone conclusion and indeed there was serious potential for the alliance to develop into a new party to the left of Labour. This post is concerned with the print media treatment of the two political groups The Alliances are broadly similar in terms of political representation and support, though the ULA probably had more activists and some parts of the ULA have sunk roots into their communities. The launches too are similar in size and style as political rallies rather than voting conferences. To compare the two alliances we will look at the press coverage of both groups and launches in five newspapers: The Irish Times, The Irish Independent, The Irish Examiner, The Sunday Independent and The Sunday Business Post. The period chosen is the month in the lead up to the two launches and two weeks thereafter (The launches were/will be held on 29th of November 2010 and on 25th of January for the ULA and RA respectively), we look primarily at the number size and position of the articles and secondly consider some of the treatment. To gather the data the Lexis Nexis newspaper database is being used with similar search criteria (see below). What we are interested in is whether the two Alliances get equal treatment or generally equal treatment both in terms of quantity and quality, and if either Alliance receives any support or opposition. This is of interest as the mainstream media, while not being the only source of political knowledge for the general population, is still a key. The print media remains an important part of the media sphere most especially in terms of agenda setting and the development of political themes and frames over time. In normative terms the media should offer equal access to various sides of the political and economic debate, however, as long pointed out by critical scholars, due to issues of ownership, institutional work practices, the class makeup of journalists, and sometimes target audiences, alongside wider ideological processes, there is less than equal access in the mainstream media between what can be termed conservative or mainstream voices and left or alternative voices. In political terms the media may play an important role in developing support for or opposition to political parties or groupings by either publicising, supporting, opposing or ignoring their existence. This is not to be overly deterministic around the mainstream media as political movements can built through ‘boots on the ground’ and how they relate to various events and issues and ‘objective conditions’. Also materially wealthy groups can bypass media by use of advertising, or develop a media presence by the use of public relations. It is, however, important to recognise the role of the media in constructing political discourse, agenda and debate which is of particular importance in the media’s role in disseminating information about a new formation on a national level. In short the media remains both a key battleground and source of soft power in the political sphere and its treatment of various political groupings is important. The ULA and the Reform Alliance, almost identical in terms of political support, offer an opportunity to test the Irish media on this point.This first post will consider the treatment of the ULA, while a second later post will look at the treatment of the Reform Alliance. The cacophony of voices which say that the individual measures of the plan are not necessary tend to be quieter in explaining where the money should otherwise come from – beyond infantile sloganeering. The notion that most Irish people – who are, let us not forget, among the best-paid and most lightly-taxed in Europe – won’t have to pay anything if we can somehow get Dermot Desmond and Denis O’Brien to open their wallets is hardly worthy of serious debate. The disregard for our established politics is spreading. Last week, the TEEU trade union promised a campaign of civil disobedience against the four-year plan. One senior and experienced politician reflected privately that ”there will be civil disorder”. But Sinn Fein in are far from the only people using this language. A few minutes earlier, Socialist Party MEP Joe Higgins launched a new United Left Alliance across the road in Buswells Hotel. Higgins is a sincere and committed politician and, unlike most of his colleagues in the last Dáil, chose to accept only the average industrial wage, devoting the rest of his salary to political activities. 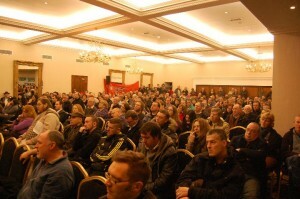 We can conclude with certainty that the print media did little to inform the public of the processes taking place around the formation of the United Left Alliance nor publish anything in the build up to the launch meeting; meaning that most people outside of the organised left probably knew little of either the launch meeting or of the Alliance’s existence. How this compares to the coverage of the Reform Alliance will be investigated in part two of this blog. 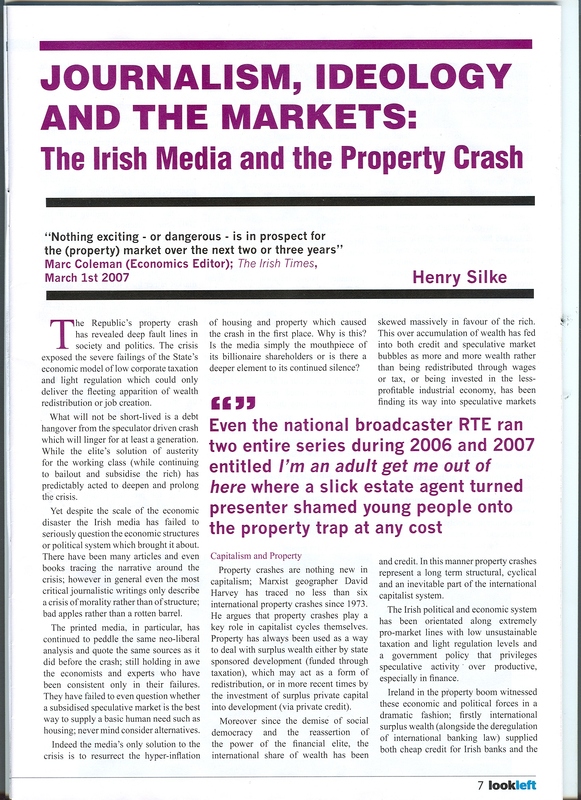 The role of the Irish media in the property crash and following economic crisis is again hitting the headlines with a Sindo special edition promised this Sunday (10/11/2013); the Irish Left Review has also recently published an interesting piece on the role of the media by Bryan Wall on the fifth anniversary of the banking guarantee, while research from UCD’s Julien Mercille into the media’s role in the property crash continues to attract interest here. 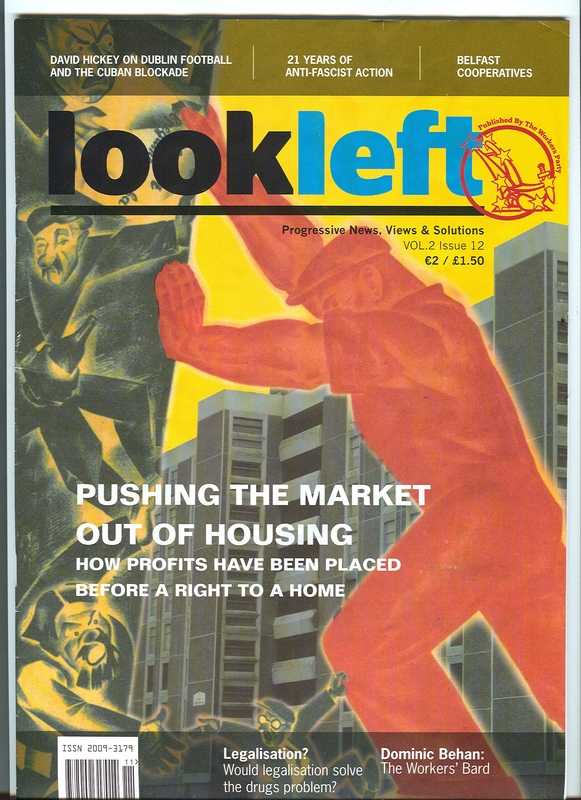 In light of this renewed interest CMR will post an article previously unavailable online on the role of journalism, ideology in market crises published in Look Left. 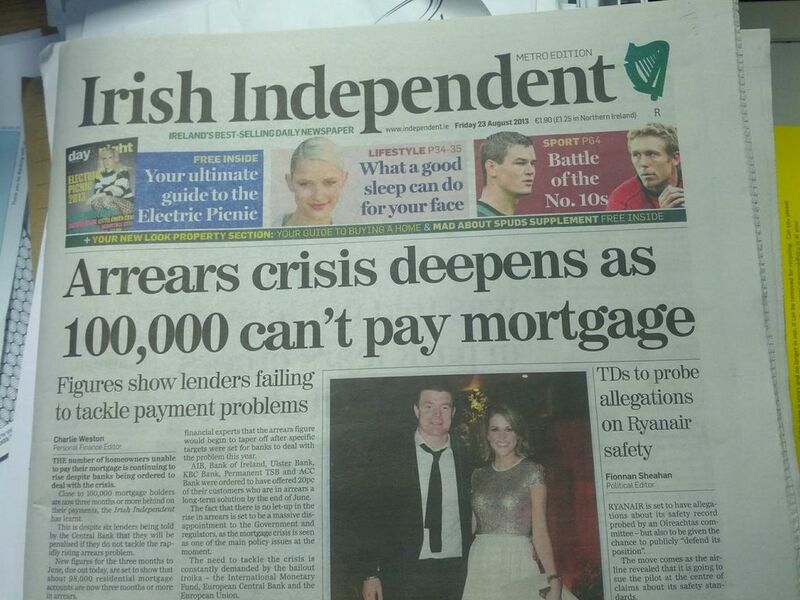 This article considers the role of communications and media in crises of capital focusing on the Irish crash. 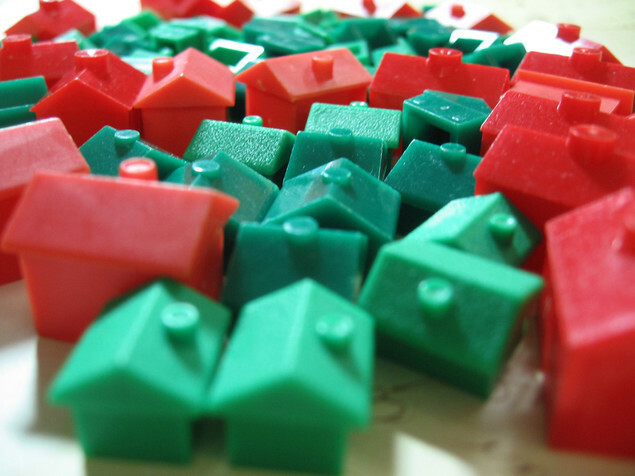 Other articles on the property crisis by the author are available here. On July 14th 2013 the Irish Independent published a fascinating article by Tom Lyons entitled The Gloomsday Book: who was there on the night of the guarantee; the article is not interesting so much for the narrative of who met whom and when but more so for the journalist’s normative judgement of who should be listened to in times of key economic crisis. The article while expressing the usual journalistic class biases about ‘bearded trade unionists’ offers an illuminating insight into journalistic sourcing; that is who and what organisations the press speak to in terms of policy decisions and crisis and who they consider relevant. The article discusses the diary of the Minister of Finance on the day of the decision of the banking guarantee with a normative discourse on who was worthy of the state’s attention on that most infamous of days. 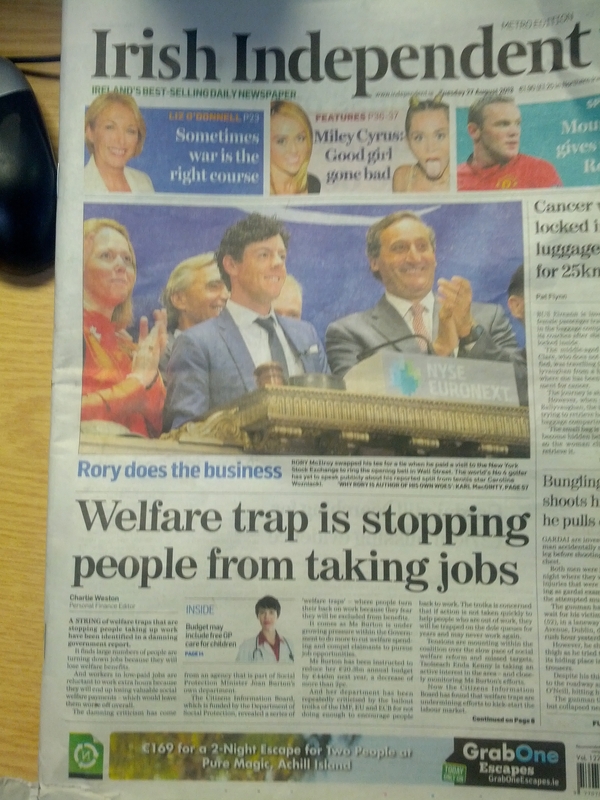 As an aside the article declines to remind us of the newspaper’s own support of the guarantee at the time nor its role in publishing at least one article lobbying for the guarantee in advance of its proposal and another in advance of its implementation; but as with the press and the housing bubble we are well used to institutional short memories. What is interesting in this article is that it expresses to us some illuminating thinking about who they believe it was relevant to talk to on the day of the blanket bank guarantee, a blanket bank guarantee that has had negative aspects throughout all of society. …At 4pm, six representatives of different charities including Protestant Aid, the Children’s Rights Alliance, Cori and St Vincent de Paul all sign in to see the minister. These charities are more relevant to Ireland in the years following the bank guarantee than in the hours beforehand. 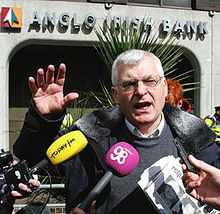 Then at 4.50pm David Begg, the general secretary of the Irish Congress of Trade Unions who sat on the board of the Central Bank during the boom turned up for some reason or other. He was accompanied by Paul Sweeney, the trade union economist. A few minutes later, another three ICTU officials showed up, though it is not clear who they were planning to visit. At 5pm, Jack O’Connor, the president of ICTU, showed up – another bearded trade unionist with zero banking expertise is there to see the minister. The fact that neither Mr Lenihan nor his civil servants thought it wise to clear his schedule so he could focus on the banks again underlines how out of their depth they all were. So if the state shouldn’t be dealing with pesky bearded trade unionists who should they be speaking to? Just after Mr O’Connor bustled in, Padraig O Riordain, the managing director of Arthur Cox, showed up in the department – finally, someone who knows about banking had signed in. So there you have it, an expert, not that such an expert could possibly have any special or vested interests or hold any conflicting brief – this question is not considered at all. The fact that this law firm while advising the state also represents elite groups in Irish society, especially banking and finance is not alluded to. We can only conclude in the Independent’s view that when this societal crisis was in process, actors from society outside of the world of finance and banking had no role to play. As I said at the beginning of this piece this is an illuminating insight into the thinking of journalists that explains somewhat their own practice. In a sourcing analysis* of the week before and after the bank guarantee itself in 2008 this attitude was replicated in both the Irish Times and the Irish Independent. The research found that in stories covering the bank guarantee business and finance made up 23% of total sources while non business elements of civil society only made up 2%; trade unions made up none. In terms of politics, while state and party political sources made up about half of the total, Fianna Fail alone made up half of that. Non mainstream political parties got a total of two lines in one article, (a mention of an email from Socialist Party rep. Joe Higgins), the ratio to pro-anti guarantee political parties was around 8 to 1. In terms of frequency or how often people were sourced the trend is repeated. In fact in the news section of the Irish Times about a third of articles only sourced government or state representative. Figure One: Percentage of complete sources by type in the Irish Times and Irish Independent on the issue of the 2008 blanket bank guarantee 21/09/2008 – 5/10/2008. NB this chart is of complete sources but not frequency of sources, that is numerous sources may appear in a single article. For example although media makes up 8% of sources it does not appear in 8% of articles, it is made up by few articles with numerous sources in each. The fact that the newspapers came out in such support of the guarantee is hardly surprising considering the narrow nature of its sources, the research found that while the 81 articles published about the guarantee could be described as supportive only 16 and 22 could be described as negative and neutral respectively. Apart from some honorable acceptions most articles seemed to accept mainstream political and business sources without serious critique. Why does this matter? Because politics, political policy and ideology in general is often a battle of conflicting narratives, and here the evidence clearly shows, as does Tom Lyons’ illuminating piece, one narrative dominates the Irish press, and that put simply is a class and market based narrative which serves elite sections in society, and while the press continue to have a somewhat influential role in the media and wider society this is deep concern. *This research is part of an ongoing PhD thesis on the Irish press and the financial crisis.